El Nicho came up early when planning this trip (which was very minimal - let me tell you :D). 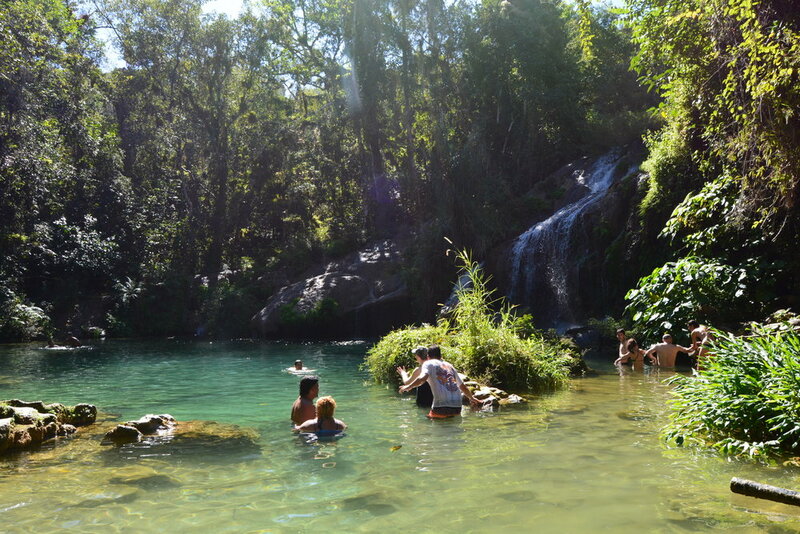 I had searched for "cool places in Cuba" and the lush waterfalls and swimming pools of El Nicho topped many lists online - and for good reason! The detour and windy drive up the mountains was worth because it was SO BEAUTIFUL. We had spent the last week in bustling towns and on the beach, so it was a welcome contrast to be shaded among all these beautiful trees and ferns. And hanging from all the branches were MASSIVE air plants (my latest obsession) - probably 2 feet in diameter. I was so tempted to smuggle one back through customs for my apartment! My favorite part was obviously swimming in the pools - we hung out in the above pool for over an hour, swimming to the natural rock landings at the base of the waterfall and just soaking up the sun in the water. I remember feeling so at peace and calm in those waters (I could have stayed for hours longer!) and thought it was a healthy mindset to start 2017! We went straight from El Nicho to our final destination. Our last evening was spent in Cienfuegos, which, to my surprise, felt more modern and established than Havana. Like Havana, the architecture reflected the city's era of prosperity; in Cienfuegos, prosperity came from its sugar exports and the city is clearly influenced by French styles rather than Spanish, as in Havana. However, fewer buildings seemed vacant or run down, which I assume, reflects the fact that the drastic economic downturns in Cuba in the 1960s and then again in the 1990s hit the hardest in Havana, and less so in Cienfuegos. While 7 days of unplugged travel was more than I had in a long time, I was sad to go back home - I could have spent many more weeks exploring the country. I feel like I only dipped my toe into all that makes Cuba unique and wonderful and amazing! I'll definitely have to make another trip to see the eastern part of the island and Vinales, and hopefully that comes in the near future. If you're heading to Cuba and want recommendations, tips, or advice, let me know! I've got a few notes that I've shared with friends and happy to spread them to more people!